Adapting the curriculum is only the start in making PE more inclusive. Simon Scarborough offers a few tips. One of the greatest barriers I have faced when promoting inclusive PE practice is the misconception held by some, that making PE more inclusive somehow makes it impossible to stretch and challenge the most physically able pupils. On the contrary, the adjustments I have made to teaching in PE have produced substantive evidence of accelerated learning in all pupils. In a previous blog post, I explained how you can adapt your PE curriculum so that it better accommodates the needs of pupils with SEND. But that’s only the start. 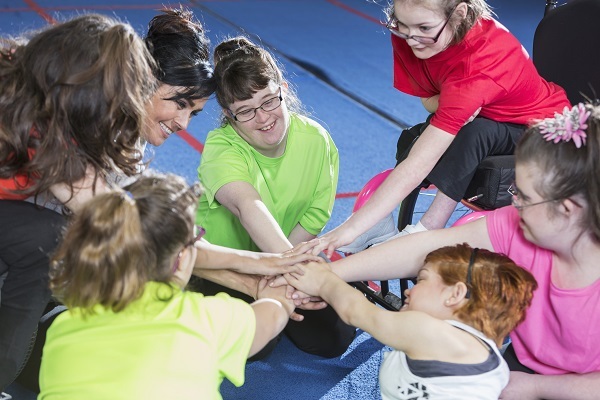 Here are five ways you can make your PE lessons more inclusive and improve engagement. I will always be a teacher who wants to get pupils engaged in lessons and make good progress as a result. This means taking the time to learn about a pupil’s needs, build a strong relationship with them and where necessary, consider the implications of neurodiversity for teaching and learning. Relationships are important because, without a feeling of trust and security, there is no foundation on which pupils can develop the confidence to engage fully in PE lessons. Over the years, I’ve seen many a PE teacher fall into the trap of investing time in getting to know only the highest achieving or most athletic pupils. This can implicitly tell every other pupil that in order to be any good at PE, they have to be physically able. Avoid playing favourites at the expense of your lowest achieving or most challenged pupils. Setting pupils by physical ability can produce fixed mindsets, with those in top and bottom sets accorded very different expectations. Ditch the labels, and you will be able to focus on honing a range of different abilities and improve each pupil’s physical performance. Pupils will begin to feel valued for their strengths, thus creating a more favourable view of PE lessons and other physical activities. In my experience, teaching assistants have always proven invaluable in helping students with SEND engage with the PE curriculum. They should take pride of place in any successful PE department. Have your SENCO and head of PE met to discuss how additional support staff might help specific students or groups of students with particular activities? make any reasonable adjustments (such as changing into kit in a separate area). How often do you gather and act on pupils’ feedback? Are pupils with SEND fairly represented on the school council, and are PE issues discussed? Could the PE department make its own investigation into how pupils perceive PE lessons? Do not underestimate the potential for change on the strength of genuine feedback. Be sure to share your findings – and anything you do as a result – with your pupils. I have long struggled with the policy of giving students a detention if they fail to bring their PE kit to school. Speaking to students in the past who openly admitted to not bringing kit in on purpose, preferring to attend a detention rather than take part in a PE lesson, I concluded that something was seriously wrong. We make it clear to students that engagement in PE lessons is an expectation, regardless of whether or not they have a kit (we’ve had some take part wearing their uniform!) as it would be in any other subject. After all, a maths teacher wouldn’t allow a student to sit to one side and do nothing if they forget to bring their calculator to the lesson. But if a student is regularly failing to bring in their kit, it’s important to talk to them in an effort to find out why, rather than rely on punitive measures. Agree on actions for you and the student to both carry out before or during the next lesson, and reinforce these with positive statements: ‘I know you are good at PE’. I challenge any PE department to take the dilemma of students not bringing kit in to their lessons as the source of pedagogical intrigue and to unpick the root cause, rather than just blaming the student for not complying with the school rules. Core PE lessons can to be the obvious solution for the senior leadership team when deciding what lessons to withdraw students from for interventions. But last term, I decided to buck that trend by making the PE department the place where students go to have their intervention. These interventions range from physical literacy programmes for pupils with dyspraxia or physical impairments, to daily sensory workouts for pupils with ADHD to help improve their focus in the classroom. One intervention I’ve been particularly impressed by was developed by a Key Stage 4 student of ours who has an education, health and care plan (EHCP). With my support, he set up a lunchtime box fit club that is open to any other pupil on SEN Support or with an EHCP, as well as those who are looked after. This has had the dual effect of meeting the needs of those pupils and fostering a better connection between the PE department and other parts of school life. We’ve seen an overall improvement in the extent of engagement and progress in core lessons as a result. I would encourage my fellow heads of PE to meet with their SENCOs and discuss how particular students could benefit from PE-based interventions (selected according to the type of need and desired outcomes), and the feasibility of running similar interventions as part of the school’s wider SEND provision map.